I can't believe on October 19,2013 it will be my one year of blogging! I am so excited, but at the same time I would not have thought that I would be blogging. But I am here and happy; along the way I have made a lot of friends and I love you all. I also hope to continue making friends. Thank you all for reading and following my blog! Anyway, in celebration of my 1 year I am doing a small nail polish giveaway! This is my first one so I am doing a test run to see how well it goes. If it goes well I will definitely do more! Important Note: This giveaway is only open to those in the US. I do apologize to those who live outside the US, but unfortunately I do not have a lot of money to mail outside. But if I do another I will include everyone! This giveaway is not sponsored by any company, social media site or brand. These nail polishes are from my top favorite brand NYC! I love their polishes. These were purchased with my own money. The colors are Preppy Pink and Tudor City Teal. These colors are so pretty! These polishes are long wearing nail enamel! 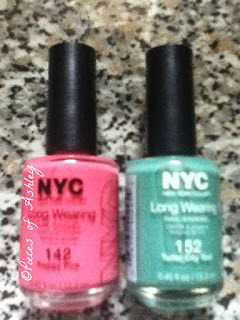 -If you want to win these 2 NYC nail polishes, fill out the Rafflecopter form below with your entries. -It's mandatory to follow my blog via GFC and Twitter as well as leaving a blog comment. The other entries are not mandatory but it will give you extra entry points. -I will be making sure you all filled out eveything, if not another winner who has filled out everything will be chosen. -Please do not make any fake accounts just to win. If you do your entries/name will be removed. -I will announce the winner on Twitter. -Winner will be contacted by email and/or direct message via twitter within a week after the giveaway closes. If the winner does not reply within 2 days, a new winner will be chosen. -If you are under the age of 18, please make sure it's alright with your parents for you to enter the giveaway and to send me your address if you win. -This giveaway is opened from October 5 to October 26. We are doing a giveaway over on our blog too hope you check up it out. I also nominated you for the Versatile Blogger Award.